The idea of teaming Superboy, the Titans's Beast Boy, Terra, Thunder, and Lightning, and Gen13's Caitlyn Fairchild, and pitting them against Ravager Rose Wilson, WildCATs's Warblade, and some well-known Titans villains, sounds pretty interesting (similar to Keith Giffen's DC/Wildstorm: Dreamwar). As a long-time fan of a lot of these characters, the appeal of Howard Mackie's Ravagers Vol. 1: The Kids from NOWHERE is largely in just seeing them together. Ian Churchill's 1990s inspired art isn't right for every title, but it's certainly right for this one. But whereas I have no great complaints about the story Mackie tells here, neither do I think it coalesces necessarily (and Ravagers is cancelled after its next volume). To some extent, for better or worse, Mackie just isn't writing for a collection; also I think Mackie relies too much on the characters' familiar histories despite that these iterations are "brand new." 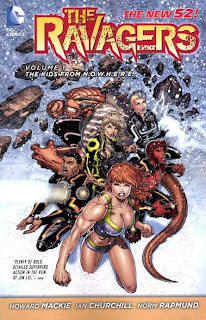 Ravagers is largely a book about super-powered teenagers trying to escape the nefarious NOWHERE organization; also Teen Titans has been, for most of its first year, about teen heroes fighting NOWHERE. This makes it somewhat difficult to differentiate Ravagers and Teen Titans, probably especially for an audience only casually interested in a spin-off title as DC's "Young Justice" line of titles has slowly shrunk. Ostensibly, I believe Ravagers is supposed to be like Outsiders to Teen Titans's, well, Teen Titans -- the "tougher" teen title. Whether that was adequately conveyed to the audience (and whether said audience necessarily cares) is another matter entirely. Mackie does well here with the dynamic of Caitlyn Fairchild as the voice of reason, leading a team of five other essentially traumatized teenagers, who may long for peace one moment and enter a murderous rage the next. The Ravagers are unpredictable, they are "edgy" in this sense, and watching Fairchild try to wrangle this team of damaged heroes is enjoyable. The monstrous Ridge is the book's breakout star, not in the least for his remarkable appearance (though his on-again, off-again British accent is strange); the scene where Ridge and company are at a loss at how to spend free time on Venice Beach is priceless. The book's other two best moments are when the team goes up against long-time Titans villain (old universe) Brother Blood, and when they reach Fairchild's safe-house and meet a young Niles Caulder. Arguably this is stunt casting, favoring cameos over story (Brother Blood's relation to Beast Boy is never quite clear, and Caulder is almost unrecognizable from his Doom Patrol counterpart), these two figures help contextualize the title -- the team is kind of like the Titans, because they fight guys like Brother Blood, but they're oddities and hang out with Niles Caulder, so in a way they're the first iteration of the New 52's Doom Patrol. Unfortunately, the premise of Ravagers is built on the idea that these characters don't really know themselves, and I think it hurts the book. Neither Beast Boy nor the reader know where he came from or how he received his powers, for example, nor does Mackie offer much insight by the end of the book, and makes it hard to get behind Beast Boy as a character aside from our historical attachment to him. That Beast Boy and Terra are together in this comic should be a big deal, but we never truly understand whether their relationship is romantic (and how romantic it is), nor how they got together or what they like about one another. There's good conflict in this book, and plenty of characters, but not much character itself. Given that this is a collection of single issues, I can't fault it too much for the fact that Mackie treats each issue as a starting point, with Fairchild relating how dangerous the Ravagers are and the team's dire straits. It does, however, get repetitive, and slows the book's action, and it's space that could be used to flesh out the characters and isn't. Ian Churchill's art felt nicely restrained to me in this book -- there are still plenty of open mouths and clenched teeth in his pages, but not as much, I would argue, as in books' past. I do wonder if part of this book's passing could be attributed to readers just not giving it a chance -- prejudging it as being too 1990s with Mackie and Churchill, despite that some of the '90s greater excesses (outlandish costumes, extreme villains) aren't present here. Ravagers mostly feels like it stumbles when guest artists step in, breaking the book's flow -- Tom Raney's work isn't so different than Churchill's, but it's inked too dark in the third issue; one of the three artists in the last issue uses a painterly style that clashes completely with what came before. Writers have reputations, but in the case of Howard Mackie (and also Scott Lobdell), the New 52 was the first of their books I'd read. In Ravagers: Kids from NOWHERE, Mackie does nothing to turn me away necessarily -- it's a cogent story, if perhaps lacking a bit of "oomph." DC Comics has struggled for a while, I think, to find themselves a title like Marvel's Runaways or Young Avengers, and they still haven't found it yet. Ravagers shows the intention, but it doesn't quite reach the goal. Next week ... Matt Kindt's Mind MGMT and Green Lantern: Rise of the Third Army. Don't miss it! I haven't read any of the Ravagers, but my understanding was that the individual comics were littered with typos and errors. Did you notice any in the trade, or have they been corrected? Vaguely, I think I remember one typo, but not a lot of those, no. There was definitely an instance where the dialogue was supposed to be Terra's, but the word balloons were pointed toward someone else.